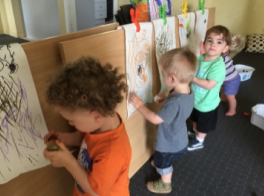 We gently support your child being able to separate from you and develop their interactions with their peers. We will be focussing on modelling a range of more specific verbs (action words) and adjectives (describing words) during play. Specific vocabulary helps your child communicate more effectively. For example, they could say that they 'got' a ball, or they could say they 'caught' the ball. When they say 'caught', we know that it was likely thrown to them as opposed to rolled to them. They will also have opportunities to introduce themselves to the group and practise following two stage instructions, e.g. "Get a hat and put it on your head." We focus on progressing and consolidating your child's early gross motor skills such as running (stopping, starting, changing direction when running), jumping (increasing height and distance), climbing stairs (one foot per step going up - may still hold on / may descend two feet per step may still hold on), ball skills & we also continue to help them develop balance and body and spatial awareness. 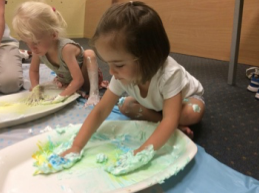 We support your child to engage comfortably in a variety of sensory activities.